Are you ever tempted to buy a lottery ticket, persuaded by an enticing prize? Have you ever been keen to buy tickets for a popular show, aware that the act is touring from overseas for a limited number of dates? Does clever technology captivate you and do you like to be conversant with it when chatting to your peers? If you answered yes, to any or all of those questions, then you have something in common with the 18th-century Dubliners and visitors to the city who paid to view a show at the "Great Room in William Street" (likely the current headquarters of the Irish Georgian Society) in 1774. The show in question, Cox’s Museum, originated in London, and was a modified, scaled-down version of an exhibition which had run at the Spring Gardens there, a leading venue for public entertainment. This was a period when leisure was becoming increasingly commercialised. Enterprising showmen in both capital cities were competing to amuse, enlighten and astound audiences, while lightening their purses. One of the star exhibits in Cox’s Dublin show, was a pair of life-sized mechanical peacocks, described by their promotor as as a "miracle of Art". The catalogue claimed that these dazzling birds could not fail in "exciting general admiration", as they turned their heads, opened and shut their beaks, and displayed their tail feathers with "a precision" that was "actually astonishing". Remarkably, there is evidence to suggest that one of these spectacular peacocks travelled onwards to St Petersburg, becoming a jewel in the art collection of Catherine the Great, Empress of Russia, and now belonging to the State Hermitage Museum. Today, in a media-saturated and technologically sophisticated world, the weekly winding-up of this automated peacock never fails to draw admiring gasps and, inevitably, images or video clips are shared via social media. So how did a lottery come into the equation? The Dublin show featured automata (moving mechanical devices) from the celebrated museum of James Cox (c.1723-1800) a London jeweller and entrepreneur. 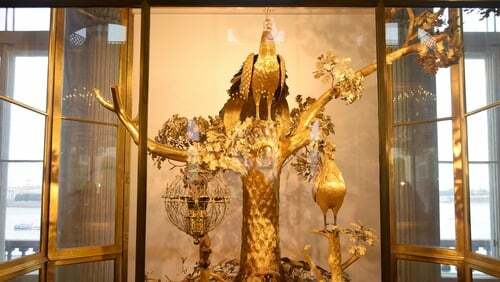 Cox had established an initially lucrative business producing elaborate musical clocks, automata and jewelled items which were primarily for export to the Far East. The overseas market for these expensive objects declined in the late 18th century and Cox’s decision to exhibit some of his finest automata in London and Dublin represented a smart strategy to stimulate the market for his wares. Simultaneously with the exhibitions, he advertised the sale of lottery tickets, touting an impressive list of prizes, including a pair of diamond earrings worth £5,000 and a magnificent silver swan. Notwithstanding his ingenuity (which would rival many modern entrepreneurs), Cox’s enterprising scheme ultimately failed to solve the issue of his mounting debts. He was declared bankrupt, the automata were dispersed and the swan (which does not appear to have been shown in Dublin) ended up in The Bowes Museum in Durham. Extraordinarily sophisticated, it is engineered to turn its head, preen its feathers and bend down to catch a tiny fish, while resting on glass rods which rotate to create the illusion of moving water. In 1774, Dublin audiences paid a crown per person to view the spectacular pair of peacocks which formed part of the Irish exhibit. This was higher than the price for many other urban shows in Georgian Dublin, reflecting not just ambition on Cox’s part, but also the refined and specialised nature of the exhibits. There were two performances a day, calculated to suit all schedules. Just inside the entrance, two mechanical flautists played duets and solos as visitors stepped inside. How captivating it must have been to hear these early robots perform "with the strictest musical truth…the wind actually proceeding from their mouths and their fingers performing the various graces of every note". Touring shows from city to city brought plenty of logistical headaches. In the case of the Irish show, Cox was evidently keen not to stir up any professional rivalries. Consummate showman that he was, he emphasised that he was mounting an unique event, but would not be taking orders as a jeweller in Dublin. He complemented Irish jewellers, talking up their skill, and tailoring his advertising to flatter the local audience. Meanwhile in Russia, Catherine the Great was busy adding to her ever-growing art collection. She understood that buying up fine art and artefacts sent a powerful statement rippling throughout Europe about her might and means. Her appetite for fine and decorative arts was insatiable and a life-sized mechanical peacock was a covetable and showy "toy". She paid almost £1,800 in 1781 for the pleasure of owning one and the purchase was facilitated by Prince Grigory Potemkin. By the time that payment for the Empress’s peacock was authorised, Cox was bankrupt and the payment was made to Frederick Jury, one of the principal craftsmen he employed. Some details of the Hermitage peacock differ from the description in the Dublin catalogue, but it seems unlikely that Jury made a third peacock at this stage, given the investment of capital, time and expertise involved. It is more likely that the peacock, which had delighted Dublin audiences, was modified before it left for Russia. Newspapers, letters and diaries from the period conjure up an urban scene where the opportunities for leisure and entertainment were endless. Commercial shows promised entertainment, at times enlightenment, and frequently, spectacle. Shortly before Cox had tried his luck in Dublin, the English antiquarian and collector Horace Walpole had commented of London that "the rage to see these exhibitions is so great that sometimes one cannot pass through the streets where they are". A life-sized automated peacock was a singular sight, never mind its mechanical entourage. Given the complexity of its mechanism, its costliness and its imposing scale, it is remarkable that such a rare bird could travel from London to Dublin and on to St. Petersburg during in the late 18th century and survive for its story to be told.